This cozy colourful 2 Bedroom beachfront bungalow features an open concept design with all the amenities of home. Walk just a few steps beyond your deck to a private sandy beach and 60 foot dock. 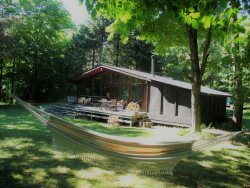 This property is located directly across from the sand dunes at Sandbanks Provincial Park. All the comforts of home are available: Full bathroom, fully equipped kitchen, microwave, TV, DVD/VCR, stereo, telephone. Safe drinking water via reverse osmosis system. One bedroom has a new double bed and the other has 2 single beds. The living room has a pullout couch for 2 overnight guests. Outdoors you will enjoy a large deck, propane BBQ, fire pit and hammock. The ample sandy beach is perfect for families and the water is sandy bottomed and friendly for children. For families and sports enthusiasts who desire a bit more action, the surrounding area has beautiful scenery and varied recreational activities including: various boat rentals nearby, swimming, hiking, bicycling, golfing, horseback riding, fishing, wind/ kite surfing, canoeing & exploring the magnificent white sand dunes. The nearby small towns offer fabulous County hospitality, marvelous restaurants, apple cider & wine tasting, art galleries, pubs, antique shops and award-winning summer theatre. This property is located next to a children's water park. See Special Notes below for more details. There is no washer/dryer at this property. There is a clothesline and a public laundromat 20 minutes away in Picton. Provincial Park Pass is included. 20% discount at The Restaurant on the Knoll Overlooking the Sandbanks at Isaiah Tubbs Resort. The television receives about 1 dozen channels including TVO, PBS and several American channels from Rochester. There are several children's VHS tapes available for guest viewing. We are a family of 4 and loved our week at Sandbreeze (which my daughter lovingly calls Colourful Cottage!). The open concept kitchen-dining-living room made it fun and easy for everyone to hang out together doing their own thing, especially with the attached porch. The cottage has a cozy and homey feel. What drew us to this property was the private beach with warm, shallow water and a private dock, the fire pit, and hammock (which we often fought over!). My toddler loved sitting by the edge of the gentle water picking pretty rocks from the sand. Prince Edward County is a favourite for us, often taking quick drives to Picton for the great restaurants, cafes and bookstore, and of course spending the day at Sandbanks with friends and family. We will be going back often to Sandbreeze Cottage! I have stayed at the property a couple of times and love it. I have a young 2 year old and the beach area and shallow water make it great for the young ones. Being across from the Sandbanks makes for easy access to the Provincial Park and a great view from the deck too. I would recommend this great cottage to anyone, especially those with young kids. Water is shallow for more than 60 feet (end of the dock). The bottom is gritty sand with 'mossy' bits depending on the current weather/water conditions. This property is next to children's water park West Lake Willy's and nearby Westlake Wakeboarding. PLEASE NOTE: This is not a quiet private getaway spot when the water park is in operation. IMPORTANT: You must put out garbage/recycling at this property following the instructions there and remove all garbage/recycling upon your departure. This owner charges $50 for garbage/recycling not removed (instructions are on the fridge at the cottage). Sandbanks is less than 5 minutes. Picton is 15 minutes. Wellington is 25 minutes. Next to children's water park, West Lake Willy's (please read special notes for more on that).